The Perfect Parmesan Pizza Dough recipe makes the perfect crust, and the mozzarella cheese adds the perfect finishing touch. 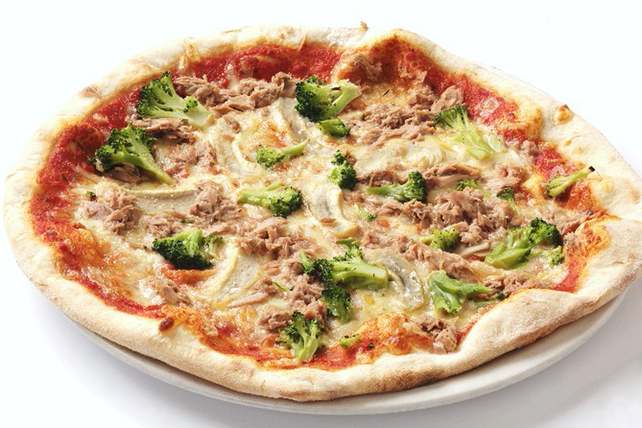 The addition of tuna and broccoli makes for a delectable grown-up pizza. Roll Perfect Parmesan Pizza Dough into 12-inch round on lightly floured surface; press onto bottom of 12-inch pizza pan sprayed with cooking spray, stretching dough as needed to fit. Spread with pizza sauce; top with remaining ingredients. Place on bottom oven rack. Bake 15 to 18 min. or until edge of crust is golden brown. Don’t have time to make your own dough? Look for ready-made pizza dough in your grocery store's freezer section.